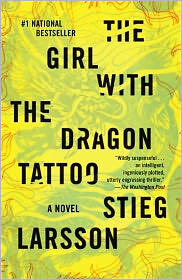 My Series Sunday pick is Book 1 of the Millenium Series by Stieg Larsson: The Girl with the Dragon Tattoo. You may have read the bestselling book, or watched the movie. I chose the latter after many recommendations and despite the annoying subtitles. This murder mystery is about the disappearance of Harriet Vanger, a young woman of one of the wealthiest families in Sweden. Her uncle is determined to find out the truth of what he believes was her murder. Mikael Blomkvist is a journalist hired to help solve this mystery. Lisbeth Salander is a 24-year-old pierced and tattooed genius hacker that assists Blomkvist with the investigation. Before long, the Vanger family saga unfolds. Unfortunately, the author died in 2004 shortly after handing in the manuscripts. It was so good, that I'm going to read the entire series now. They're only $5 each for the eBooks on your NOOKcolor, NOOK, or Kindle! Watch or download this literary and movie phenomenon today. Still not convinced? Check out the trailer.